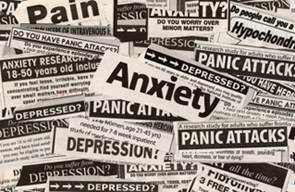 Anxiety and depression can hit anyone, any age, at any time - everyone at some time in their life is sure to experience some feeling of overwhelming anxiety. Most times it doesn't last long and is dealt with quite simply and easily. But for many people, it's an ongoing illness and it's hard to describe the pain and suffering of those with depression. It’s one of the worst afflictions anyone can suffer because whatever the circumstances of life of the sufferer, to them the experience of life is filled with hopelessness with no seeming light at the end of the tunnel. Like so many other health conditions, depression is too often treated with prescription drugs. Anti-depressants are widely prescribed without thoroughly investigating the cause. Anti-depressant drugs alter the chemistry of the brain as they try to FIX a lack or excess of brain chemicals like 'serotonin.' The SSRI (selective serotonin re-uptake inhibitors) anti-depressants for example aim to stop serotonin being lost from the brain and therefore keep you feeling happier. This whole approach of treating depression with drugs is, in fact, a very short sighted one. MILLIONS of people are being duped into thinking that they need drugs which can only ever MASK an underlying problem. What is the true UNDERLYING CAUSE of the depression being experienced? Why is it that at this time the brain does not have enough serotonin? The fact that the brain "does not have enough serotonin" is merely a SYMPTOM of a dysfunctional biochemistry, a less than optimal state of health brought about by a lifetime of contributing LIFESTYLE factors. If you agree to take tablets, and then perhaps you can’t cope without them, would you then have the motivation to address the underlying causes — IF you knew there were some, IF you knew what they were and IF you knew how to change them. There are still a lot of unanswered questions around this condition. It would seem that overwork, over-stimulation (coffee, tea, cigarettes, chocolate), too much stress, too much alcohol, not enough sleep, lack of exercise and poor diet are all contributing factors, and some or ALL of these are the TRUE underlying causes of depression. Please, please ... there is help available before resorting to drugs. Drugs should be a last resort when a person is so ill that they are incapable of reason, of hope, of self-motivation, or of understanding. The truth is that depression is merely a symptom of a body in trouble. Sometimes a drug is necessary to buy you time to sort out your life, but you need to see the big picture, and understand how to correct the true causes of depression, and know that beating depression is possible without resorting to drugs. Mike Kinnaird, in his book, Habit Guide addresses in detail SIX lifestyle elements that have a powerful influence on your mood. Simple things that you can do to improve your state of mind and general wellbeing. Reading 'Habit Guide' will definitely help you to understand depression and beating depression will be made so much easier if you follow Mike's Habit Guide. Some simple basics steps you can take are: start a walking program, eat lots of fruit and veg, get plenty of sleep, de-stress, learn to relax, drink lots of pure, clean water, learn how to let go of compulsive thinking, spend time with loved ones and generally get more organised. Do these things and see for yourself what a difference it makes. Click here to return to the site directory to find out what other information is available here.